Every year, I get most excited at this time of year about boots. They are basically the only footwear I utilize between October and April, if not longer (silly Chicago). For the past couple of years, I've limited myself to one nice new pair a year since they can be so expensive. This year, I'm not sure what to do. I splurged early during the Nordstrom Anniversary Sale on some gorgeous Sam Edelman booties, but now I'm wondering if they should really count as my one pair. There was a little asterisk on the deal I made for myself, and that asterisk says that only tall boots count towards this rule. And, since I'm following a monthly clothing budget this year, as long as another pair of boots fits into my budget, then really, what does it matter? Do you set weird clothing rules for yourself? Which pair is your favorite? I need a new tall brown pair (mine are so worn out)- so the shopping begins! Ooh loving all of these! I have too many boots too, but I always want more. I do need a pair of skin-tight knee0high boots though..ha ha. okay now I need to go shopping, lol! I have only three pairs of fall boots (that I usually wear in the winter too) but my wardrobe is BEGGING for more! Thanks for the inspiration! Plus, that knee high cognac pair is stunning. It's very hard to choice, this is really a fantastic selection! I wear my Sam Edelman booties all of the time. Great picks! I'm loving the Sole Society Franzie boot! 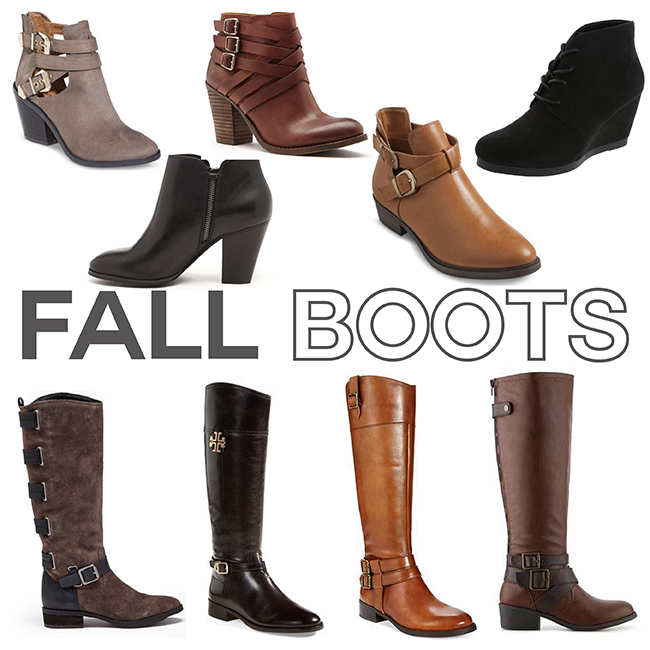 Every year I get really excited about all the new fall boots...and this year is no exception! I can't wait to invest in a few pairs of booties for fall. I really love those top brown pair with the 3 buckles. i love those short tan ones. i swear i could own 1,000 pairs of boots, theres just so many options! I'm so excited to wear boots!!! The first pair of booties is amazing! Those Tory riding boots are beautiful. I'm still kicking myself over a pair that I didn't buy last year so I say your asterisk counts. I should also probably follow your lead and set rules for myself. It seems like a really good way to stay on track. And here I am telling your to break them... I'm sorry. I'm convinced I will never have enough boots in my possession! There's always something new and amazing that I want. I love your picks, especially the pair of booties on the top left! I always find myself drawn to boots this time of year...how can you not? Those Tory boots are gorgeous! I love all boots!! But i must say, I am partial to those criss cross booties! Those ones are Target, really can't believe the price. The cognac "Dawn" boots from Target are SO SO SO cute! I really want a pair, but my Target only has them in black, which I'm not as interested in. I desperately need to get a new pair of tall black boots, though. They are such a staple in my wardrobe, and my 3-year-old Target pair finally bit the dust this past spring.